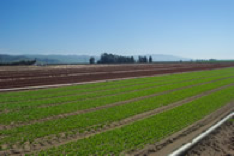 American Farms, in Salinas, CA, grows a variety of vegetables, including broccoli, spinach, and specialty lettuce, on approximately 9,300 acres in the Salinas Valley. More than 60 percent of their fields are in organic production. 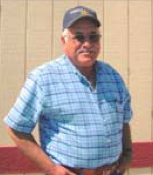 American Farms greatly reduced their water usage when Israel Morales, who was the Ranch Manager for over twenty years, implemented a system of wider-permanent beds, minimum tillage, and permanently placed sprinkler pipes for economic savings. Over the forty years that he farmed in California, Morales noticed that too often both time and water were wasted on the fields. Water-saving techniques were implemented on American Farms as a more cost and time efficient system. With the solid set, or permanent, irrigation pipes, reduced tillage, wider permanent beds, and use of transplants, American Farm saves time, money, and water. American Farms adopted a number of new techniques to save costs and water, and create a more efficient farming system. Implementation of this new system with wide permanent beds and a solid set sprinkler system, required additional changes in the production system. The major barrier in adopting the new techniques was the upfront costs, but as Israel explained, once you pay those initial costs, there are immediate benefits. Under the new system, American Farms widened their planting beds to 80 inches, established a solid set sprinkler system, implemented minimum tillage, and planted transplants instead of seeds. The solid set irrigation system required nearly twice as many pipes per acre. Additionally, Morales had to design his own cultivation equipment that would work within the minimum tillage and permanent bed system. In order to maintain the new system at American Farms, the tractor drivers were given GPS devices for use with the permanent planting beds, solid set sprinklers and transplants. GPS technology reduced time needed for tractor use, which resulted in less exhaust created from the tractors. The farm lost nearly 8 percent of their ground to establish the solid set sprinkler system; however, the use of transplants allowed the farm to make up for the loss in land by planting more often. Although the new system required many changes, the benefits have been great. The solid set sprinkler system saved water by reducing leaks that are common in mobile irrigation systems, and allowed for irrigating based on the needs of the plant rather than a schedule. The solid set system also reduced crop damage often caused by moving mobile irrigation, and allowed for multiple plantings a year. Implementation of minimum tillage practices reduced soil compaction and increased soil organic matter, both of which foster water infiltration and deep root development. The permanent beds reduced evaporation from the soil, and required less irrigation. American Farms serves as a great example for on farm water conservation while maintaining an efficient farming operation.